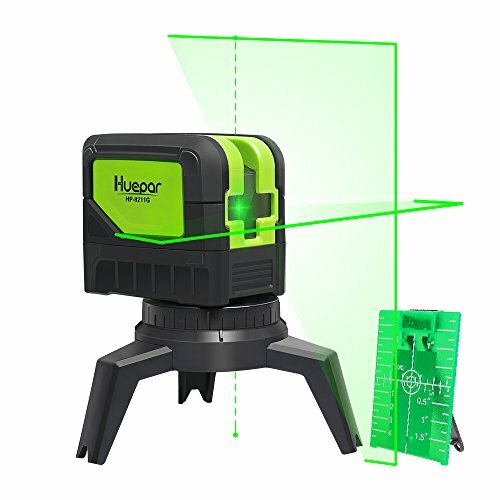 Green Laser levels are really great laser levels for making sure that you are getting the precise measurement for all of your projects, whether they be at the construction job site, or at your home while working on a DIY project. These are a better choice than red laser levels, just due to the simple fact that they can be detected better with your eyes AND by electrical detectors, which is a huge deal for technicians and construction engineers. Since precision is necessary in any project, you cannot be without a green laser level in your toolbox. Why is Green better than Red? Green is an overall more superior choice over red laser levels. 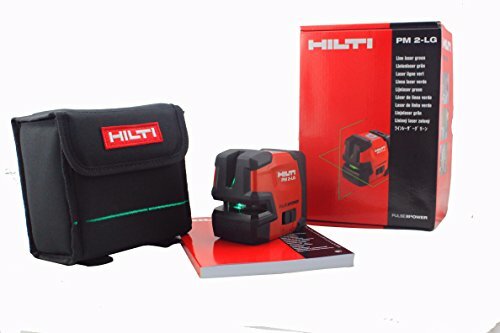 First, green is a brighter color than red, therefore, the laser is brighter and makes it easier to see when you are using it to measure on a jobsite that includes industrial type construction equipment and other leveling power tools. Second, green in easier on the human eye. Green lasers can be seen four times better than red lasers, which is a huge deal on the job when you are trying to get the most accurate measurement to ensure that the project turns out correctly. Green lasers are also detected better by electrical detectors as well. The Green laser can transmit easier over longer distances than red lasers, too. In fact, the green lasers have longer ranges and they can cover more area. This means that usually it only takes one try to get the measurement, whereas, it could take multiple tries with the red lasers. How do you use a Green Laser Level? Laser levels project a beam of light that is used as a visual guideline when a level reference point is needed for accuracy. The power needed to produce a green light is a lot more than the power needed to produce a red light. Therefore because of this, usually the battery life is a lot shorter for the green laser levels than the red ones. No matter what color the laser level is, it is important to never look into the laser light directly as it can be extremely harmful to a person’s eyesight. It should never be directed at another person period. Green laser levels are becoming a more popular staple in many toolboxes across the country. Here are ten green laser levels that you should consider adding to your toolbox immediately. 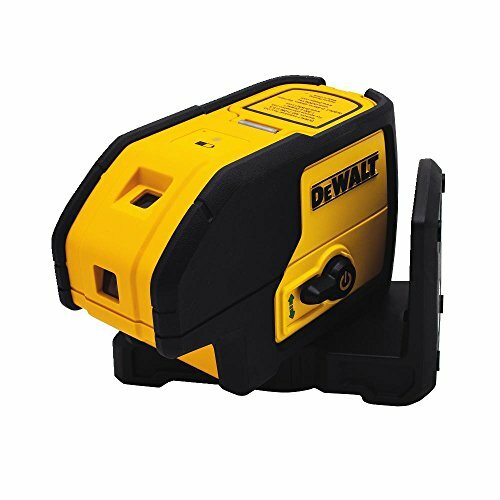 This green laser level made by DeWalt, offers a 360 degree line laser that helps to measure the full room layout. The laser level is about 12.5 inches tall and is about six inches long. The green laser beam technology is four times brighter than red lasers. There is an integrated magnetic bracket, making it easily attachable to anything that is metal on the construction site for a variety of places to measure and reaching hard to reach places. The over-molded housing keeps the laser inside safe and secure, keeping out different harsh elements of the jobsite. This laser level is cordless, which makes it ultra-portable and helps with accuracy as well, with 0.125 give or take. The laser level has a 12V lithium-ion, rechargeable battery. 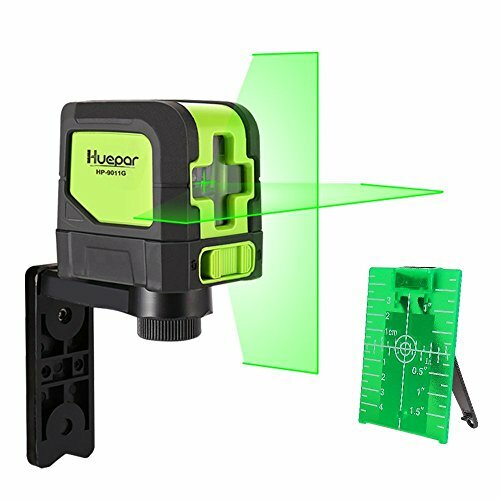 This green laser level made by Huepar is another top choice for a laser level unit. The soft grip and lightweight design makes it easy to fit on your tool belt and easy to handle in your hands. This is great for renovation projects such as flooring, framing, and laying out tiles or simply hanging pictures. The green laser inside of this level is adopted from Osram’s laser unit, which was originally produced in Germany, and is considered the best green laser unit in the world at this present time. This green laser is two times brighter than a red laser with the same light source and is still accurate in the sunlight or indoors. This laser projects a cross with accuracy of about a ninth of an inch give or take at about 100 feet out with full visibility. 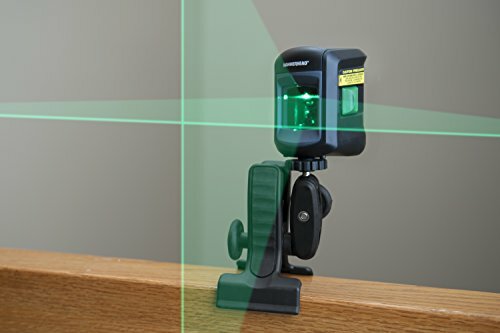 The laser has a tripod that it is compatible with and can be used to adjust the laser height if needed. The tripod is not included with the laser level, though. 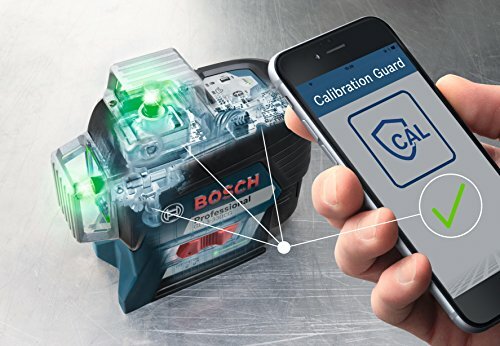 The laser level has a unique feature called Self-Leveling Mode, in which you are able to program the unit to self-level on an inclined surface within four degrees. This is a great option for those contractors that are super busy and doesn’t have time to waste. The manual mode is also great as well, with technology to where you can prevent the laser from going off plumb or level while it is being transported from one place to another. The fixed clip can be turned 360 degree, which gives you a variety of angles to measure from. The Bosch green laser level is a three plane leveling and alignment line laser that is complete level as well as an alignment laser. This laser quickly squares in and projects the room layout with different level lines that have a 360 degree plane, one horizontal and two vertical. With VisiMax technology, this green laser level has the power to maximize line visibility and to help your overall battery life last longer than ever. The green laser offered on this level is up to four times brighter than most red beams on the market. The laser level has a measuring range up to about 200 feet in diameter. This laser level offers a pulse mode to extend the range to about 330 feet in diameter in bright lighting, which uses a LR8 or LR6 receiver. This green laser level from Pacific Laser systems offers a rugged design that can stand up to all of the harsh environments that come with different construction sites. This laser level has been drop tested at one meter and passed, which helps ensure that you’re getting a very durable product. This is a self-leveling, three point laser level allows you to get your measurement fast and accurately. This laser level is accurate up to six millimeters and has a working range up to 30 feet out. This laser level includes a magnetic wall bracket, perfect for helping the laser attach to any metal for easily measuring things that are in harder to reach areas. This green laser level is about three times brighter than red ones. Pacific Laser Systems even offers a three year warranty because they stand behind their products thoroughly. 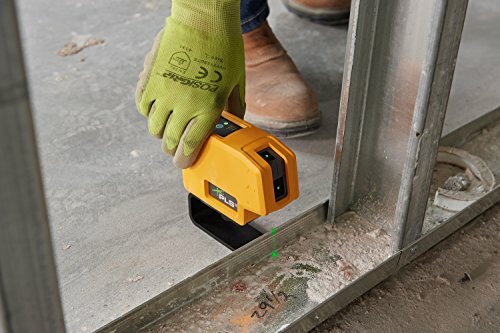 This green laser level offers two points and a cross-line for the benefit of a two-in-one laser. This point and line laser gives contractors in the commercial and remodeling trades the maximum amount of versatility to accomplish all the projects that they need to accomplish. This line of accuracy is about a ninth of an inch give or take at 33 feet. The LD blue-green laser unit is twice as bright as a red beam and uses the same power source, which obviously makes this laser level the better choice. This laser level is self-leveling on an inclined surface within about four degrees. If it is not level, there will be a flashing alert that will let you know that you are out of the parameters. You will definitely know for sure that you are measurements will be in the correct ranges with this level. The laser is covered by TPR soft rubber for a shock resistance that will be helpful on construction sites. There is a one year limited warranty and up to two years longer if you become a loyal customer through product registration. 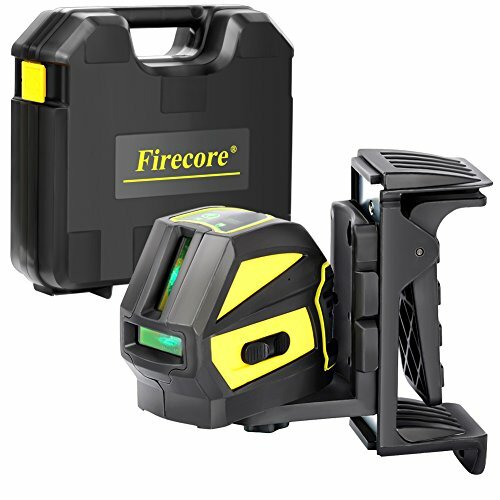 The F118G is a green laser level that is perfect for professional use. It can project two lines independently or together. This green laser level has a working range of up to 65 feet and an accuracy level of up to an eighth of an inch. The green laser level is housed in a box that has a lot molding on it to keep it covered from the elements of a harsh construction site. This level has been dropped tested from one meter, ensuring that this level is very durable. The laser level also comes equipped with a magnetic bracket that helps the level connect to any metal on the job site. This also helps to measure and hard to reach places. The green laser level provides a long laser line fan that can go up to 135 degrees horizontally and 140 degrees vertically. It also creates a visibility of about 360 degrees of a vertical plane when it is placed next to a wall. This laser has manual mode and also offers self-leveling mode. This laser level also runs off of three AA batteries but will give a low battery indicator when the laser is working less than 3V. This product is a green laser level that offers a pendulum level as well. This product and self-level and has a vertical accuracy level about 4 degrees. The working range of this green laser level is about 70 meters with a receiver and about 20 meters without receiver. When you position this laser level to measure, it produces two lines to measure from. The laser ones offer about three millimeters of accuracy give or take. Since this laser level is designed in a cube shape, it makes it extremely compact and really portable. This laser level can fit comfortably in the palm of your hand. It comes equipped with a hard plastic covering that covers the green laser and protect it from any dust or dirt or water that may try to get inside all the construction site. On top of the plastic covering, there is also rubber to give a good grip for you to hold onto and to prevent any scratches from forming on the outside of the laser level. There is also a locking system on this laser level that helps lock in the measurement so that is not changed while it is being transported from one destination to another. This compact and green laser level offered by hammerhead is a really Great way to get the measurements that you need quickly and easily. It offers a self-leveling crossline green laser beam. The projection of this line can either be horizontal or vertical onto flat surfaces. The accuracy level of these beams are about a fourth of an inch give or take at about 30 feet out. This unit will self-level when it is within 4 degrees of level. An LED indicator will tell you when the laser level is not level anymore. In the lock for manual mode the beam can be positioned to produce lines at any angle that are not level for the project at hand. This laser level also includes a clamp that is adjustable so that you can place it anywhere and get any measurement accurately. Since the laser is green, the laser beam is very bright in interior lighting and outdoor light. This laser level is powered by two AA batteries and includes the clamp mount to place the clamp on top of for accurate and easy measuring. This green laser level is perfect for outdoor use. Horizontal and vertical lines with large coverage areas will also fan out to cover the entire measuring area for precise measurement. This laser level has a durable rubber housing to protect it from harsh elements like dust, dirt, water, and other things that are on the job site. The laser level also offers a pendulum lock for a higher robustness. You can switch between independent and simultaneous laser lines for horizontal and vertical lines. The laser is accurate at 24 degrees within three millimeters, give or take. This unit is powered by four AA batteries and is recommended for indoor or outdoor use. The three spot green laser from Dewalt is truly a really great laser to use for professional use or for do it at home projects. This laser level includes a power switch, which is made to turn the pendulum lock off for added durability. The built-in magnetic pivoting bracket makes it easy for this laser level to be mounted onto any metal service on the job site. This green laser level has been dropped tested at one meter, to ensure that its lasts for a long time in your toolbox. This laser level has an IP54 rating for outstanding protection against the elements on the job site. The laser beam that is produced from this laser level is visible at 100 feet. Its accuracy level is accurate up to an eighth of an inch give or take at 30 feet. 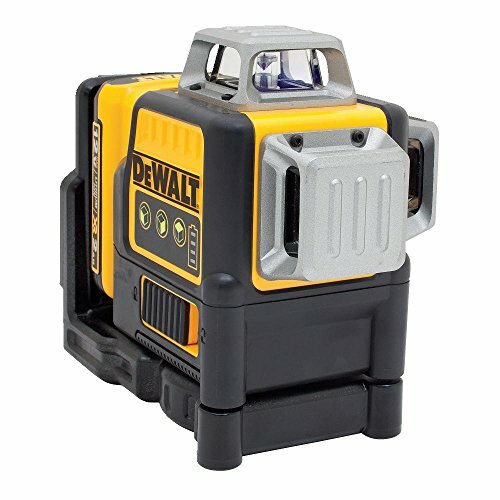 The unit includes two AA batteries and is also backed by DeWalt’s three year limited warranty. Green laser levels are truly the best ones to use and professional construction projects or if you’re doing a project at home DIY. These are just 10 of the green laser levels are offered on the market today, but there are many others. Check out these green laser levels for yourself to see if one of these may be the best one for you!